This shad pattern is very effective when fishing bodies of water that are inhabited by any species of shad, peanut bunkers , menhaden or poggy. The fly combines the flash, shape and even texture of the prey species. The main ingredient in this pattern is Sili skin. 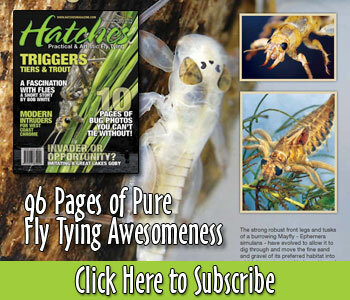 It is a product made primarily for fly tying. Unlike a lot of our tying materials which tend to be by products from other industries, Sili skin was made for tiers. Since it has hit the market with the Gummy minnow it has had a love or hate following among tiers. It takes a bit of technique and a bit of patience to work with this material, but the results, when done right , are worth the effort. This pattern is highly adaptable and can be altered by size as well as color. Try to match the size of the forage fish in your waters. Cut out two triangle pieces of clear sili skin and remove the protective backing and sandwich the tip of the mono between the two clear pieces. Cut a triangle out of the tail to make it a fork tail common in most shad species. Wrap your thread down to the clear sili skin securing it to the mono and then back to the center of the hook shank. In order for this fly to ride hook up we will have to add lead wire to the opposite side of the hook. I suggest three to five strands of .025 lead wire. After the lead is secured you can whip finish and remove the bobbin for now. The sili skin added to form the internal bulk can be made with any color material as it will be covered in the final steps. I normally use scrap for these. In this case it is pink from another project. Chose a piece that is not quite as long as the shank. Remove the backing and press the sides together sandwiching the hook as shown. Trim the excess in a semi-circle. The final piece of sili skin used is our outer layer . For this fly I have chosen a silver holographic scale pattern. This piece should cover from just behind the hook eye to overlap the front edge of the tail pieces. The width should be such as to provide enough girth to emulate a shad. Fold the sili skin in half to create two equal sides. Before removing the protective sheeting , cut a hole where the hook will pass through. Remove the hook from the vise to envelope the fly with the outer skin and then trim the excess. Return the hook to the vise and tie on anew to secure the outer layer of sili skin just behind the hook eye. Add the eyes of your choice and with a black marker you can add a false eye to either side as well. Fred, this is a great looking pattern! Looks like a great pattern and real nice match for the peanut bunker in the NE. Wonder how it will fish though? Since it’s tied upside down on it will fish upside down won’t it? Dom ,it will ride hook up . That is why the lead is tied in on top of the hook to offset the weight of the fly . Nice one Fred as always.